In the past few years, a new approach has been experimented for the calculation of the populations of vibrational levels of molecules involved in chemical reactions in ionized gases. The approach that can be defined as neo-diffusive is based on the use of numerical techniques to solve a Fokker–Planck equation in the space of internal energy. The transport coefficients are calculated from the rate coefficients of the reactions between molecules in different vibrational states. It represents a conceptually different alternative to the much used state-to-state (STS) approach, based on the solution of the Master equation. The neo-diffusive approach differs from a similar Fokker–Planck equation-based approach used in the 70s and the 80s of the past century, since exact numerical solutions are used. In this work, the state of the art and perspectives of this new approach are analyzed. Is it pointed out that, while the neo-diffusive method allows us to calculate populations of vibrational levels and reaction rates with much less computational effort than methods based on the Master equation, greatly important is that this method provides a powerful basis for intuition, allowing to highlight effects otherwise obscured by the complex network nature of the STS approach. 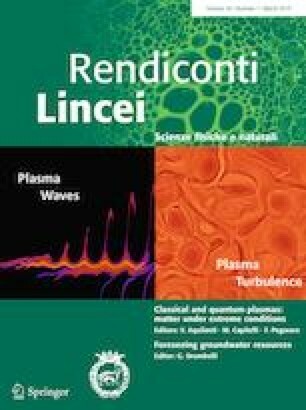 This contribution is the written, peer-reviewed version of a paper presented at the Conference “Classical and quantum plasmas: matter under extreme conditions” held at Accademia Nazionale dei Lincei in Rome on April 5–6, 2018. This work is part of the Shell-NWO/FOM initiative ‘Computational sciences for energy research’ of Shell and Chemical Sciences, Earth and Life Sciences, Physical Sciences, FOM and STW, project number 14CSTT02, “Fast and accurate computational approaches to molecular dissociation in non-equilibrium plasmas: the case for CO2 dissociation”.